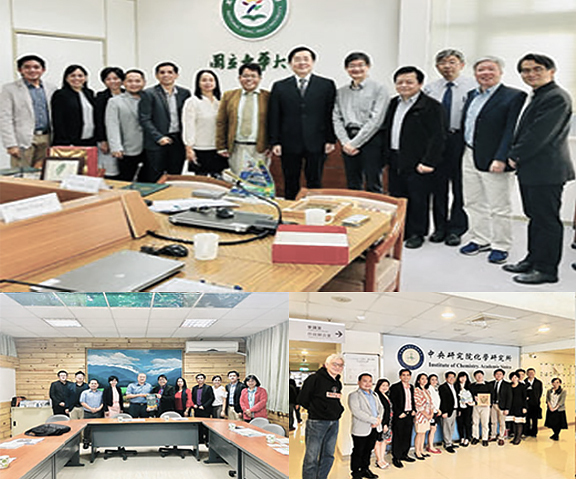 Academia Sinica, a research institute based in Taipei was first visited and the team was received well by Dr. Yu-Ju Chen, research fellow and director of the Institute of Chemistry in the same institution. Presentation of the different research thrusts by different researchers in the institute and a visit to their facility such as bioimaging, solar cell, and mass spectrometry laboratories were the highlights of the visit. Academic exchange and cooperation in education and research between Institute of Chemistry in Academia Sinica and Caraga State University was agreed by the partner institutions. National Dong Hwa University in the county of Hualien was visited next and the group was welcomed by its university President Dr. Han-Chieh Chao. A Memorandum of Agreement and Exchange Agreement was signed by the two university presidents stipulating cooperative relations between National Dong Hwa University and Caraga State University that are of mutual interest to both parties. The CSU representatives also went to the National Pingtung University of Science and Technology in Pingtung. A visit to biomechatronics laboratory and collaboration meeting with the Department of Forestry took place. They also handed out books entitled Climbing Plants and Forest Management that were authored by their resident forestry professors. The group were then received by NPUST President Dr. Chang-Hsien Tai and discussion on renewing the partnership and agreements followed. A Memorandum of Agreement and Exchange Agreement was also signed by the CSU and NPUST presidents.